Former Chagos Islands residents forcibly removed from their homeland more than 40 years ago suffered "a significant injustice" in a legal case, the UK's highest court has been told. The islanders have gone to the Supreme Court to challenge a decision made by the House of Lords in 2008, which dashed hopes of a return home. Their legal team argues information about a feasibility study was not disclosed before the decision was made. The court reserved its judgement. Families were forced to leave the Indian Ocean islands in the 1960s and 1970s to make way for a United States Air Force base on Diego Garcia, the largest of the group of islands. Monday's hearing was the latest in a long legal battle over the right of the islanders to return to their homeland. 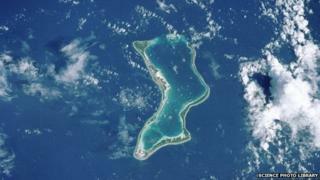 In 2000, High Court judges ruled that Chagossians could return to 65 of the islands, but not to Diego Garcia. In 2004, the government used the royal prerogative - exercised by ministers in the Queen's name - to effectively nullify the decision. Then in 2007, the court overturned that order and rejected the government's argument that the royal prerogative was immune from scrutiny. However, the following year the government won an appeal, with the House of Lords ruling the exiles could not return. In the latest hearing the head of the legal team, Edward Fitzgerald QC, told a panel of five Supreme Court justices that the Law Lords' decision in 2008 relied heavily on a 2002 feasibility study into resettlement. That study concluded the costs of long-term inhabitation of the outer islands would be prohibitive and life there precarious. It is now clear, Mr Fitzgerald argued, that the non-disclosure of relevant materials meant a Chagossian leader could not properly challenge that study. He said there were grounds to reopen the case. "There has been a significant injustice in the earlier proceedings, whether or not there was bad faith," he said. "And there is clearly no alternative remedy." Judgment was reserved to a later date.